Preheat oven to 425˚F and line large pizza stone or baking sheet with parchment paper. In large bowl, combine hash browns, egg, melted butter or bacon drippings, and salt and pepper. Mix well to coat and turn out onto prepared pizza stone. Shape into large 12-inch circle and press down firmly. Bake 20-25 minutes, until edges are beginning to brown. Remove and reduce oven temperature to 350˚F. Heat butter in large skillet over medium low heat. In large bowl, whisk eggs and milk until well combined. Season to taste. Pour into skillet and let sit 30 seconds without stirring. Then use spatula or wooden spoon to stir, lifting and folding from bottom. Continue until eggs are cooked through. 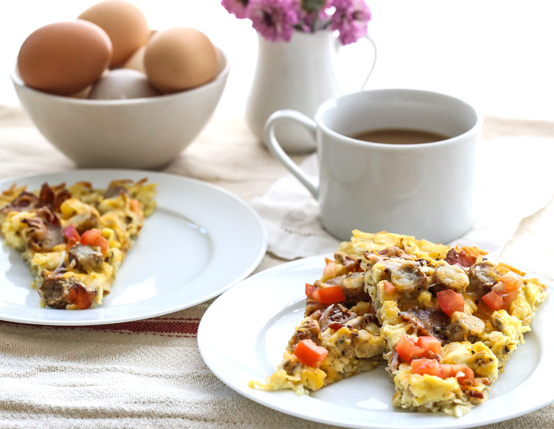 Distribute scrambled eggs over crust; sprinkle with crumbled bacon and sliced sausage. Top with shredded cheese. Bake 20 minutes, until cheese is melted.